Known as the "red cultures" in cheesemaking, corynebacteria are used in the production of an orange/yellow surface color formation on cheese. Corynebacteria produce a characteristic "sulphur" aroma associated with such cheeses as Limburger, Brick and other washed rind and smear cheeses. 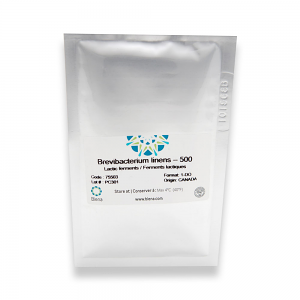 Brevibacterium linens, Arthrobacter nicotianae, geotrichum candidum: Specific blend for flavor of Normandy cheese and a balanced surface flora between penicillium candidum and acid-sensitive bacteria. Brevibacterium linens: dark reddish color, high aromatic potential, high proteolytic activity. Brevibacterium linens: Light orange color, high aromatic potential, moderate proteolytic activity. Arthrobacter nicotianae: Cream color, strong aminopeptidasic activity (reduces bitterness), very fast growth. Brevibacterium linens: Bright orange color, less aromatic than LR.